What IS this?? Keep reading to find out. 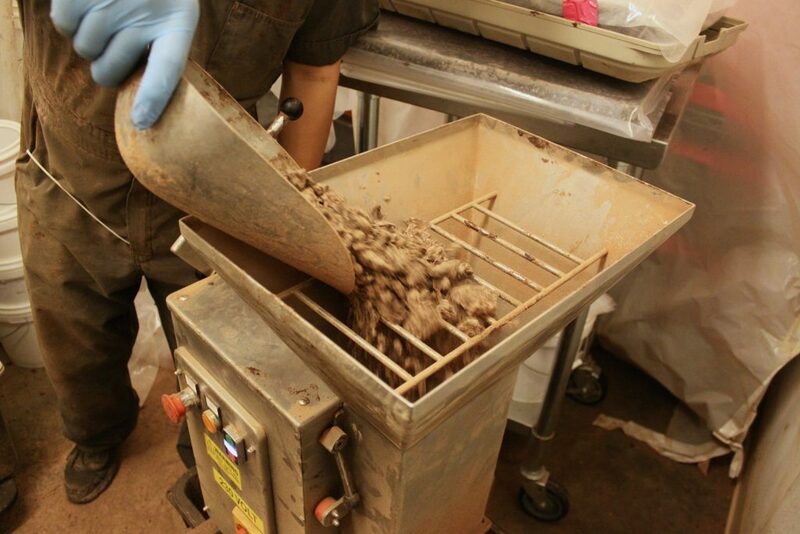 Sometimes people ask us how we make our hot chocolate so, well, chocolatey. Do we pour chocolate from our melangers (the machine that grinds, conches, and mixes cocoa beans and sugar to turn them into chocolate) straight into their cups? Sadly, if we poured chocolate from a melanger into your cup it would solidify pretty quickly and be too thick to drink. So how then, do you make a thick, rich hot chocolate? The answer is that we make a rich base with ground chocolate. But what, might you ask, is ground chocolate? Is it like cocoa powder? Most hot chocolate recipes are based on cocoa powder, which is in its own way a kind of ground chocolate so that would be a good guess, but they are very, very different. Since this often seems to be a confusing subject, I’ve taken the opportunity to demonstrate some of the differences between the two. So if not ground nibs, then what is cocoa powder? I’ll give you a clue: cocoa powder comes from a part of the cocoa nib. Cocoa nibs are composed of two things (if we’re being relatively simplistic): cocoa solids and cocoa butter. Now, it’s worth saying here that there are no definition of “cocoa solid” that is universally agreed upon. 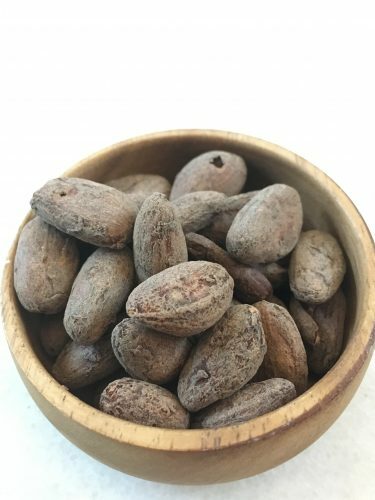 Technically, there are non-fat cocoa solids (the brown, flavorful stuff in a cocoa nib) and fatty cocoa solids (usually called cocoa butter). For simplicity, we call the brown flavorful component the “cocoa solids,” and the fat “cocoa butter.” So, we’ll roll with that for now. 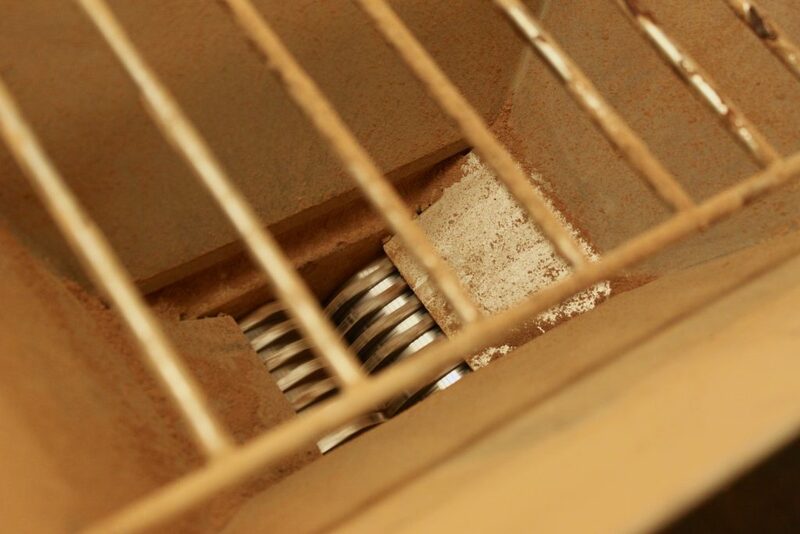 Back to our programming: cocoa powder comes from the solids. But how do you separate the two? 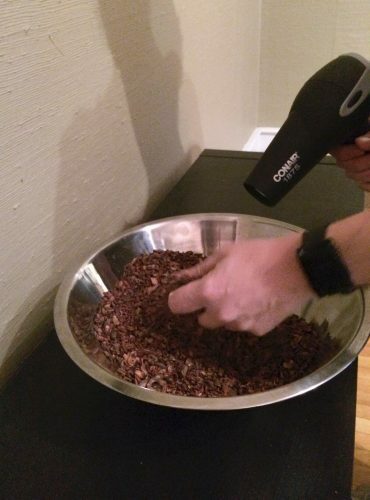 Well, it takes some heat and a lot of pressure to press most of the cocoa butter out of the cocoa nibs. 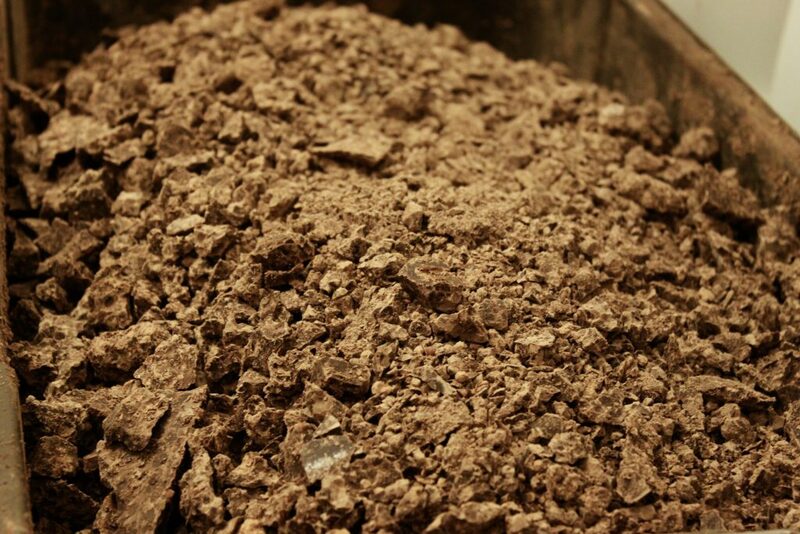 To make cocoa powder, the remaining solid parts of the nibs are ground up. Since most of the cocoa butter was pressed out, cocoa solids won’t liquify when you grind them up, instead becoming a dry powder. 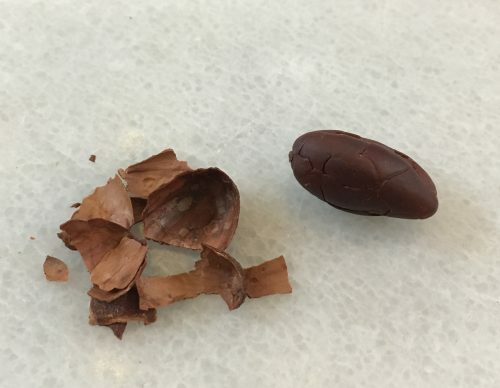 In the video below, I’m pressing the cocoa butter out of our nibs using a seed oil extractor, and the butter that comes out is still brown because it’s not a perfect pressing. But, you get the idea. An interesting note: Sometimes cocoa powder is chemically treated with an alkali solution to make it taste less acidic and more “chocolate-y.” These will be labeled “Dutch-processed” or “alkalized.” For more on Dutch-processed versus natural cocoa powder check out David Lebovitz’s informative blog on the subject. So, what is ground chocolate? 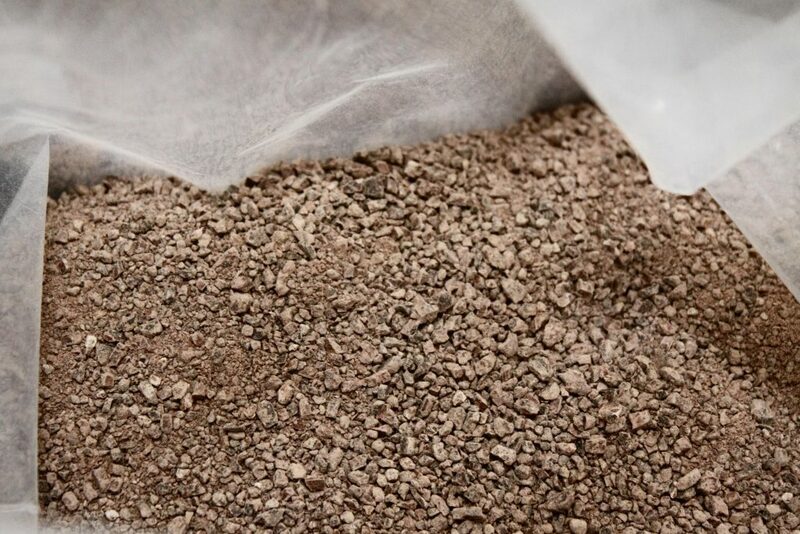 In short, ground chocolate is just what it sounds like: chocolate ground into a powder. Most of the ground chocolate we make at Dandelion is made out of 70% dark chocolate (ingredients: 70% cocoa nibs and 30% sugar, by weight). 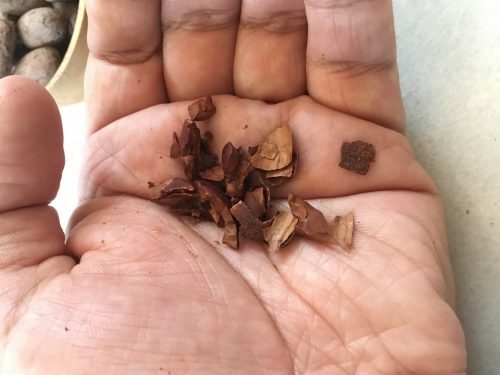 So to recap, cocoa powder is basically cocoa solids (with a tiny bit of fat that couldn’t be pressed out), and ground chocolate is three things: sugar, and cocoa solids and cocoa butter (the two components of nibs). 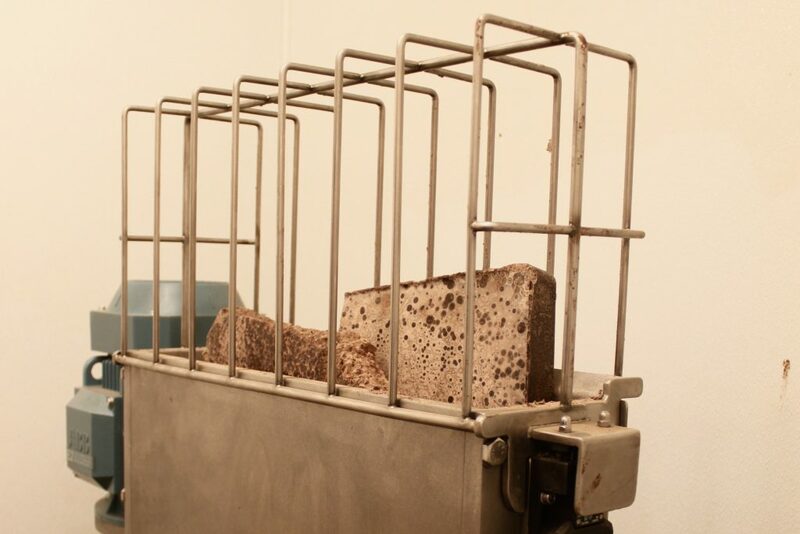 We recently got a few new machines to help us make ground chocolate from untempered blocks of chocolate. You have to be careful not to heat the blocks too much or grind them for too long because, of course, chocolate melts. 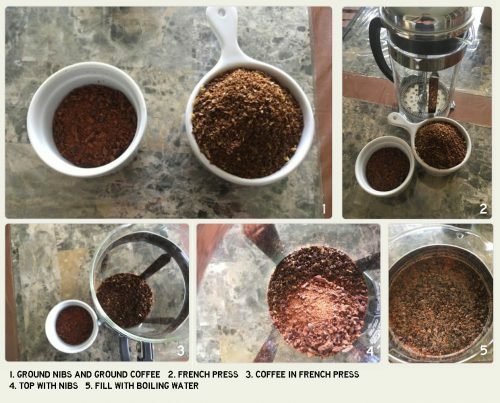 To grind the blocks, we used to use an industrial food processor, but we’ve recently upgraded to a fancy shmancy granulator that is much quieter, faster, and more consistent. Yummy chocolate! But the particle sizes are too big still. 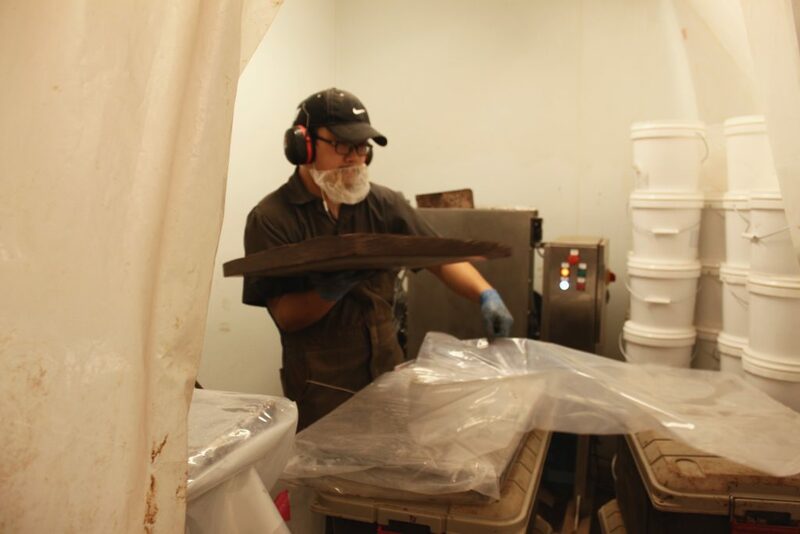 So, Eric then scoops the broken down chocolate into the refining machine. 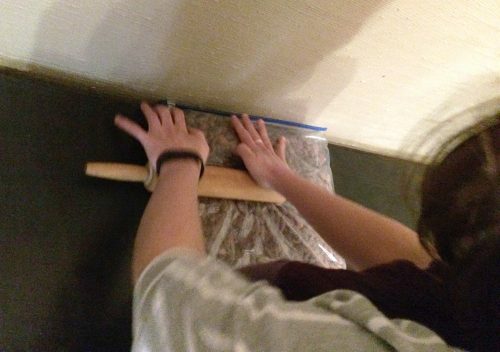 Leaving us with even ground chocolate, ready to make hot chocolate with! Those were cool photos, but I’m still a little confused about how cocoa powder and ground chocolate are different…. Okay – well let’s look at them in the real world. To make hot chocolate we need some heat, right? 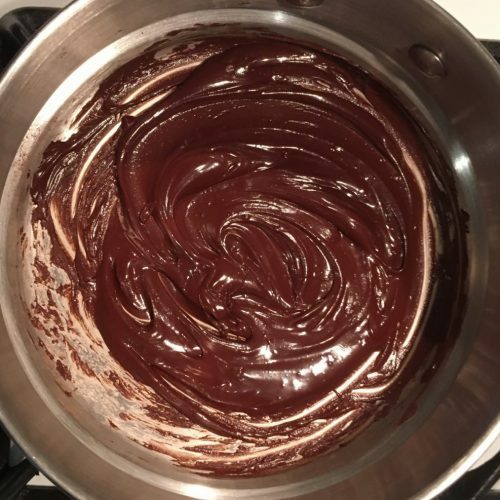 What happens if we gently heat cocoa powder and ground chocolate on a double boiler? Cocoa powder has between 11% and 22% fat (because it’s nearly impossible to press all the cocoa butter out) and ground chocolate has more like 35% fat, so they behave differently when heated. Heat cocoa powder, and virtually nothing will happen. It balls up a little, but can easily be whisked back to its starting texture. On the other hand, the ground chocolate, a fattier substance with some sugar in it, will melt fast. To return it to its starting state, we’d have to cool it and toss it in a food processor. 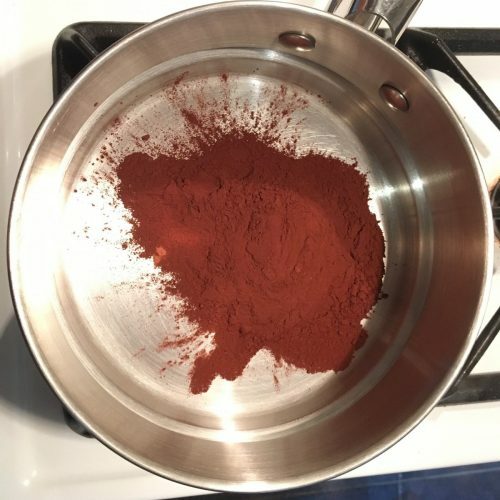 When 3 oz of steamed almond milk were added to 2 tablespoons cocoa powder or 2 tablespoons ground chocolate, the cocoa powder rose to the top of the container. Meanwhile, the ground chocolate started to melt. 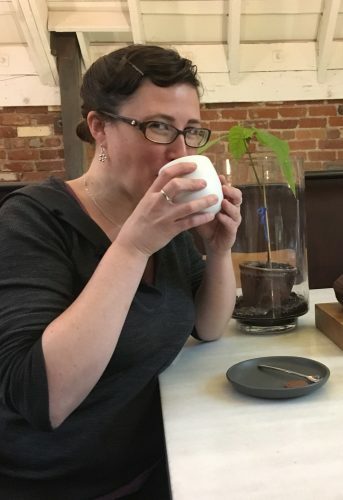 When stirred, the milk and powders mixed into each other in a similar manner, but the hot chocolate made from ground chocolate was slightly thicker. The hot chocolate made from pure cocoa powder was more bitter since it had no added sugar and a strong chocolate flavor, but it was less creamy and rich and noticeably thinner. The hot chocolate made from the ground chocolate was thicker and clung to the whisk a little more. 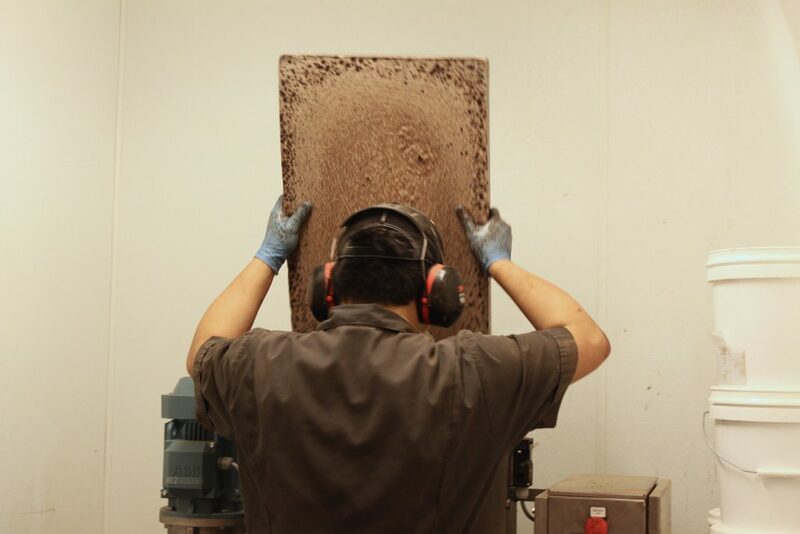 Here at the factory, without a 50-tonne hydraulic cocoa butter press, we don’t have or make cocoa powder, and so we’re only left with what we do make: chocolate. This is a fundamental difference between our pastry kitchen and most pastry kitchens, where cocoa powder is a baking staple. 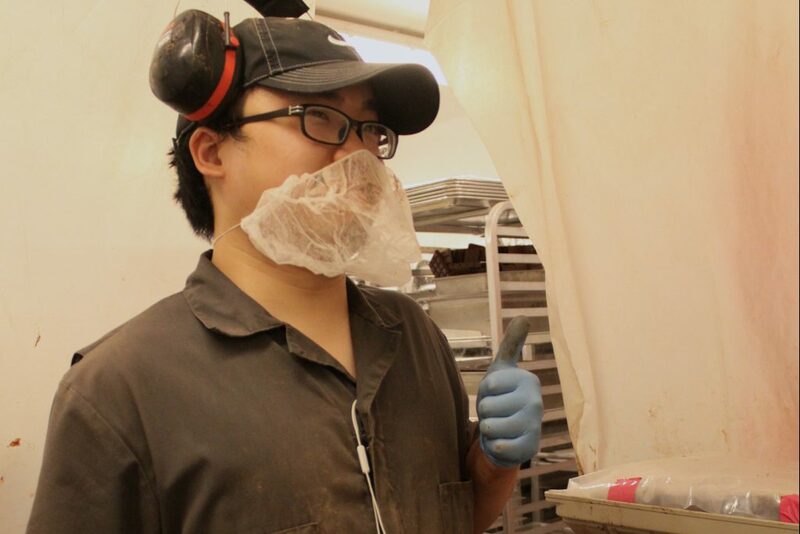 Our Executive Pastry Chef, Lisa Vega, and her team are constantly improvising ways to work with chocolate instead of cocoa powder to make cakes, cookies, custards, and more. Single origin ground chocolate brings a few more challenges to the table—the fat level varies from origin to origin—and you can’t just swap ground chocolate in for cocoa powder because, as you’ve seen, they are quite different. But lucky for me, I get to savor the rich chocolatey hot chocolate from our pastry team every day. Later this year, you’ll get a full look inside our kitchen and all of its secrets as part of the book we’ve been writing for the last two years, coming out in late fall. But for now, we’ll include a recipe for our hot chocolate below. Now, if you’ll excuse me, I need to go order myself another cup. And stay tuned for our next installment of Education Station, where we’ll explore some more chocolate mysteries. Next stop: Is White Chocolate, Chocolate? Our house hot chocolate is one of the simplest, most delicious ways to enjoy chocolate as a drink. We recommend it with marshmallows or nibby whipped cream, both of which you’ll find in our book—a guide to making chocolate at home, sourcing beans, and making pastries with single origin chocolate—coming out later this year! Combine 1 cup (225 grams / 8 ounces) of milk and the brown sugar in a large heatproof bowl set over a pot of simmering water. Add the chocolate to the hot milk and whisk to combine, keeping the bowl over the pot to continue . Whisk the mixture for an additional 3 minutes, until shiny and emulsified. This mix——may seem quite thick at this point. Whisk in the rest of the milk, adding it in a slow stream, and heat for another 4 to 5 minutes, whisking occasionally, until hot. Remove the bowl from the pot of water, pour the hot chocolate into mugs, and serve immediately. Todd once mentioned that he makes banana bread with cocoa nibs. The idea stuck with me, and I’ve been eager to try. 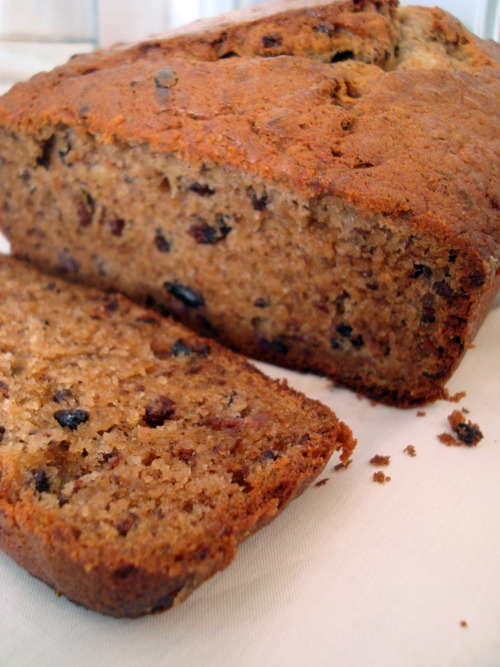 I grew up on my grandma’s Southern banana bread- a dense cake, with lots of sugar and buttermilk. I love her recipe, but I thought that our nibs would pair better with bolder flavors and a lighter texture. So, I worked from recipes from Martha Stewart and Smitten Kitchen, adding in our nibs. The bread was wonderful. The cocoa nibs softened in the oven, but maintained a bite. They accentuated the flavors of the spiced batter without adding an overpowering chocolate taste. The bread was a little like my grandma’s; it was still sweet, with the tang of buttermilk. But, the layers of flavor in this recipe went far beyond a more typical version. I’d make this again any day- it’s a delicious variation on one of my favorites. 1. Preheat oven to 350 degrees. Butter and flour a 9-by-5-by-3-inch loaf pan, set aside. 2. Cream butter and light brown sugar until light and fluffy. Add eggs, and beat to incorporate. 3. In a medium bowl, whisk together flour, baking soda, and salt. Add to the butter mixture, and mix until just combined. Add bananas, buttermilk, vanilla, bourbon, cinnamon, nutmeg, and ground cloves; mix to combine. Stir in nibs, and pour into prepared pan. 4. Bake until a toothpick inserted into the center of the bread comes out clean, about 1 hour. Let rest in pan for 10 minutes, then turn out onto a rack to cool.